I don’t know why certain foods seem so complicated and difficult to make. Maybe it’s the fancy smancy name. Or the fact that I’m convinced I can’t make food better than a restaurant. Whatever the case may be, I’ve always wanted to make tomato bisque soup but have been too scared to try it. Jonathan and I went for a date to La Madeleine a few weeks back. I ordered a side of tomato basil soup. It was divine. Over dinner I mentioned how I’ve always wanted to make tomato bisque but was too scared to try. So Jonathan challenged me – make it by the end of the week. Melt the butter in a large saucepan over medium heat. Stir in the onion, celery, carrot, and garlic. Cook and stir until the vegetables are tender and beginning to brown, about 8 minutes. Stir in the flour and cook 1 minute longer, stirring constantly. Stir in the tomato paste, chicken broth, tomatoes, sugar, and nutmeg. Bring to a boil over high heat, then reduce heat to medium-low, cover, and simmer 15 minutes until the vegetables are very tender. Pour half to three-quarters of the soup into a blender-depending on how chunky you want it-filling the pitcher no more than halfway full. Hold down the lid of the blender with a folded kitchen towel, and carefully start the blender, using a few quick pulses to get the soup moving before leaving it on to puree. Alternately, you can use a stick blender and puree the soup in the saucepan. Return the pureed soup to the saucepan and stir in the cream. Cook over medium heat until the soup is hot. Season with salt and pepper to taste before serving. Aside from the very unusual, but thankfully short, protest of dislike from Julia, the meal was a hit. The recipe made enough that Jonathan and I both had seconds and there were still some leftovers. Double score! 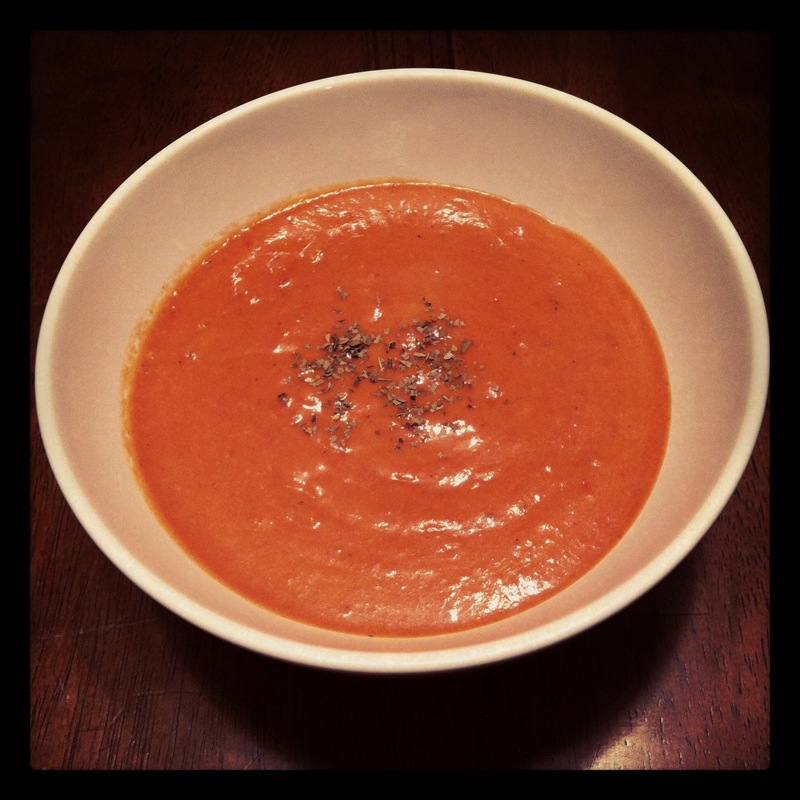 11 Responses to "Tomato Bisque Soup"
This sounds really yummy. Is Bisque just thicker/has a few more ingredients than regular tomato soup? Alicia – yeah. There isn’t any real difference, other than the thickness and flavor. I will say, it’s much tastier than any tomato soup I’ve done. I have to try this! I love La Madeline’s tomato bisque and all tomato soups 🙂 Do you think I could do something lighter than heavy cream, but still keep the rich flavor? This looks and sounds so yummy. Way to branch out and whip up a batch and good for Jon that he challenged you! Thanks for sharing perhaps it will make our menu next week. Here is the analysis of the Hunt’s products and how they are different. Recipe sounds good, and Sarah, I have kind of felt the same way about tomato bisque. According to the definition I looked up, a bisque is a thick creamy soup made from pureed veggies or seafood. Yum! Today would be a fantastic day for this soup. We are expecting our first rain of the year. I’ll have to try it, but I’ll need to change the tomatoes to just regular ones b/c I’m just fortunate to at least get those here! Bisque always reminds me of Seinfeld. Oooo, I love tomato bisque! And as much as I cook, I haven’t tried to make this one either!! But your recipe looks divine! I might just have to try it! !